Before answering the questions, here are few protocols to follow for this tag to keep going. 1. If you are tagged then do answer these questions! 2. 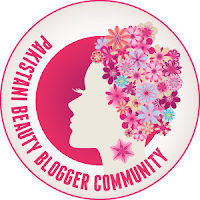 Thanks the blogger who tagged you and link back her blog in tag post. 3. 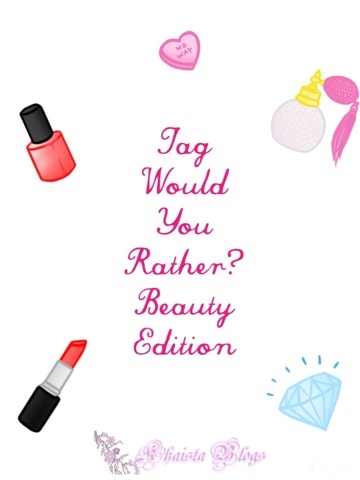 Tag any 5 bloggers whose tag posts you would like to read! Would you rather go out with messy hair and nice make-up or nice hair and no make-up? Okay, this is a not so tricky question for me. I used to go out with nice hair and no makeup for ages. But since I got pigmentation on my face, my attention diverted more to skin. A bare skin for me is a big no no. Therefore messy hair and nice makeup is my choice. Hmmm. I experience a lot of eyelashes fall out so this is not new to me. I mastered the technique to fake it but shave eyebrows… Oh boy! Would you rather wear lipgloss/lipliner look or 80’s perm? Any of these can alert makeup police but I will go for little damage and will choose overdone blush. Oh my dear Lord, why do I have to even choose? With very heavy heart, I am going for MC Hammer pants. I guess weird tan lines as there can be some excuse for them. But how will I justify soaking myself in a tub of orange-y tan? Mascara, I will say. My brushes are so important to me. I love them. Thy cost more then mascaras.. Loved reading it :) so interesting and MAC would be crying after reading our tags as no one have choosed MAC over sephora hahaha. great replies! everyone is missing you tube!